This year was a standout for several reasons. One of which because this was the first year we had not one, but TWO exhibitors from Hatteras Island. Good Winds Seafood and Wine Bar in Rodanthe, and Café Pamlico at the Inn on Pamlico Sound, both came out to represent Hatteras Island, and proudly so. Café Pamlico created an extraordinary dish using those Pork cheeks we talked about…melt in your mouth! And Good Winds stood out from the crowd with their amazing Strawberry/Chocolate cup garnering many People’s Choice dessert votes. For these first time exhibitors, they knocked it out of the park! Congratulations to them both for their awesome achievements. At the 4:30 opening of the doors, we had over 200 folks eagerly arrive anxious to try all the outstanding foods prepared. (We had about another 150 at the 7:00 session start.) Wines flowed freely all night thanks to our generous contributors Mutual Distributing, Sanctuary Vineyards, Albemarle Distribution, and Tryon Distribution. Draft craft beers by the Outer Banks Brewing Station were a hit among attendees too with flavors like Olsch, Lemongrass Wheat Ale, and a funky dark called Foxy Brown. Pepsi Bottling Ventures generously provided soda and water as well (Gotta keep hydrated!) A tremendous thank you to all these beverage vendors who contributed. Having so many choices and tasting opportunities is an integral part of the Grand Tasting experience. But the food…oh the food….was outstanding! Highlighted with lots of local oysters, shrimp, tuna, and scallops, the restaurants created flavor layers and combinations that were just mind blowing. Writing about it here just is not going to do them justice. It was truly one of those “you had to be there moments”. Our Judges had a full evening of tasting, scoring and noting the 24 eligible dishes to sample. Exquisite detail was taken to be sure each dish was judged blindly without knowledge of what Chef prepared it or what restaurant it came from (as we always do). Our Judges panel consisted of five (5) distinguished folks from around the community, with two of them being Chefs themselves. Chef Marc Beurret and Chef Donny King held soley in their scores the winner of the special Chefs Award – an award for Chefs by Chefs as we like to say. Their scores also count toward the cumulative scoring for the Best In Show and Outer Banks Catch Awards, along with our other three (3) layperson judges. Karen Brown, CEO/President of the Outer Banks Chamber of Commerce; Tim Cafferty, Chairman of the Outer Banks Visitors Bureau; and Ryan Raskin, Front-of-the-House Manager of the Blue Point in Duck (a non-exhibiting restaurant), rounded out this panel with their perspective on what tastes and ingredients sparked their palates. We can’t thank these Judges enough for their tireless effort and attention to detail in every aspect. Judging a competition like this is much harder than you might think, and we appreciate their efforts. Our Judging Supervisor, Peter Raskin of US Foods also deserves great thanks for his exacting efforts year after year. We have taken the time to put ALL the scoring information into a spreadsheet so you can see exactly how each item scored. Winning or placing one of these categories is great but it is also important to note the scores overall to really get a true sense of how each restaurant and Chef represented. So without further delay, here are the winners and scoring results below. 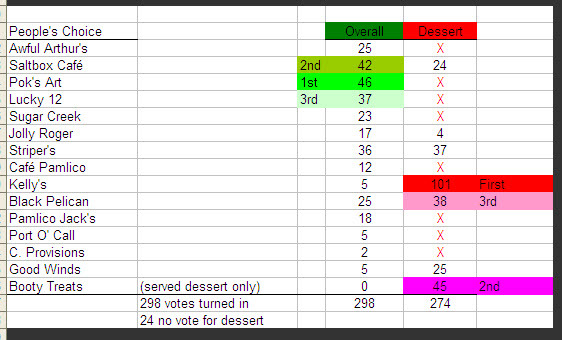 It’s very interesting to note how vastly different the judges scored certain dishes against the People’s Choice votes. But this is also why we do it this way – so that all palates are represented from highly trained Chef’s, to food enthusiasts, to great home cooks, to folks that just like what they like. with Fruits de Mer Crudo (sampling from the sea) Oyster with pickled ginger & soy, Tuna pica, Shrimp Kim Chi, Scallop with sweet chili sauce. with Seared Sea Scallop with Asiago Rosemary Polenta cake over baby arugula, frisee fennel salad with cremini mucshrooms, pancetta and citrus truffle vinaigrette. Pok’s Art Asia Fusion with Seared wanchese Shrimp with sautéed baby bok choy, pomegranate reduction with curried cashew. Pamlico Jack’s Restaurant with Lime infused hardwood grilled scallops and shrimp with pickled fennel slaw finished with smoked sea salt. with Seared Sea Scallop with Asiago Rosemary Polenta cake over baby arugula, frisee of fennel salad with cremini mushrooms, pancetta and citrus truffle vinaigrette.